If you have worked with other translation environment tools before, you may have translation memory resources that you wish to migrate to memoQ. The best way to do this is to export the data from the old system in TMX format. Delimited text formats (such as WordFast TMs) can also be imported. 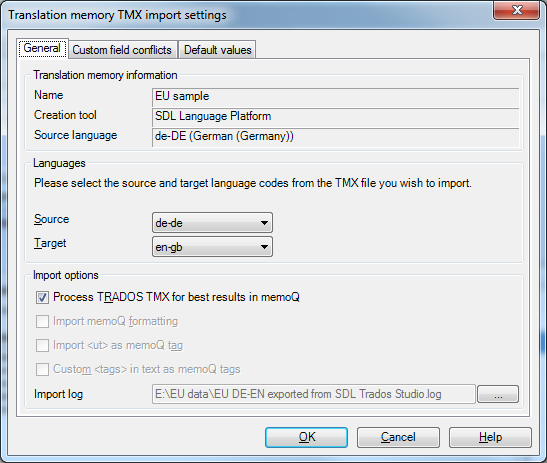 To bring the data into memoQ, first create a new translation memory with the appropriate language pair. This can be done via Tools > Resource console… > Translation memories > Create new or in a project via Project home > Translation memories > Create/use new. In most cases, you will want to use the default TM settings. After this, your translation memories are ready to use in memoQ.